The Plant City Strawberry Festival is upon us … and last week we had an opportunity to visit a hotel property that would be perfect to stay at during the festival. 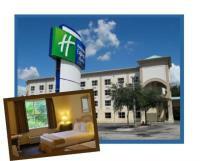 The Holiday Inn Express Plant City, just minutes away from downtown Tampa is close to not only the strawberry festival but also LEGOLAND, and Dinosaur World, Florida State Fairgrounds and many other attractions. Their location is perfect for those attending sporting events held at either of the nearby International Softball Federation, Mike Sansone, or the Randy Larson Four Plex sporting fields too! Surrounded by verdant tropical foliage, this four story all inclusive 70 room hotel accommodations includes 16 suites and 54 standard rooms, meeting space for up to 60 people has also just completed its beautiful million dollar renovation, that sets a relaxing tone for vacations and business trips alike. Guests will enjoy the fantastic amenities including free hot breakfasts, and one really cool aspect to their hot free breakfast is the pancake machine that will get you geared up for the day, and the beautiful outdoor pool offers a place to relax once work is done. Again conveniently located minutes from downtown Tampa, I would definitely recommend it to anyone who wanted a great property and a great price! A great big kudos to Charles Harris, VP and his wonderful staff, for having us visit! Until the next time ... THINK TAMPA and stay tuned in for more updates, places to stay in Tampa Bay!